Electronic Health Records (EHRs) contain a wealth of information, but accessing and (re)using it is often difficult. Archetypes have been shown to facilitate the (re)use of EHR data, and may be useful with regard to clinical quality indicators. These indicators are often released centrally, but computed locally in several hospitals. They are typically expressed in natural language, which due to its inherent ambiguity does not guarantee comparable results. Thus, their information requirements should be formalised and expressed via standard terminologies such as SNOMED CT to represent concepts, and information models such as archetypes to represent their agreed-upon structure, and the relations between the concepts. The two-level methodology of the archetype paradigm allows domain experts to intuitively define indicators at the knowledge level, and the resulting queries are computable across institutions that employ the required archetypes. 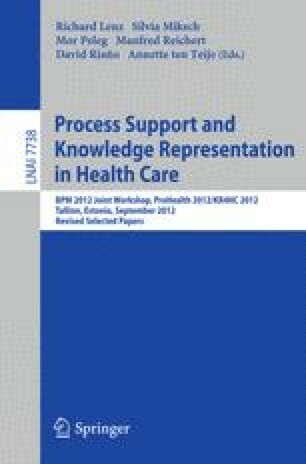 We tested whether openEHR archetypes can represent both elements of patient data required by indicators and EHR data for automated indicator computation. The relevant elements of the indicators and our hospital’s database schema were mapped to (elements of) publicly available archetypes. The coverage of the public repository was high, and editing an archetype to fit our requirements was straightforward. Based on this mapping, a set of three indicators from the domain of gastrointestinal cancer surgery was formalised into archetyped SPARQL queries and run against archetyped patient data in OWL from our hospital’s data warehouse to compute the indicators. The computed indicator results were comparable to centrally computed and publicly reported results, with differences likely to be due to differing indicator definitions and interpretations, insufficient data quality and insufficient and imprecise encoding. This paper shows that openEHR archetypes facilitate the semantic integration of quality indicators and routine patient data to automatically compute indicators.